At the end of a secluded flag lot drive just beyond East Hampton Village, awaits your peaceful country home sited on a one-of-a-kind expansive property. Set on 2.3 lushly landscaped sprawling acres, this custom-build residence is now being offered by the original owner. This represents an incredible value opportunity with no other home at this price point with this much acreage available this close to Town. Upon entering, embrace the bright, airy great room, anchored above by a breathtaking, beamed cathedral ceiling. 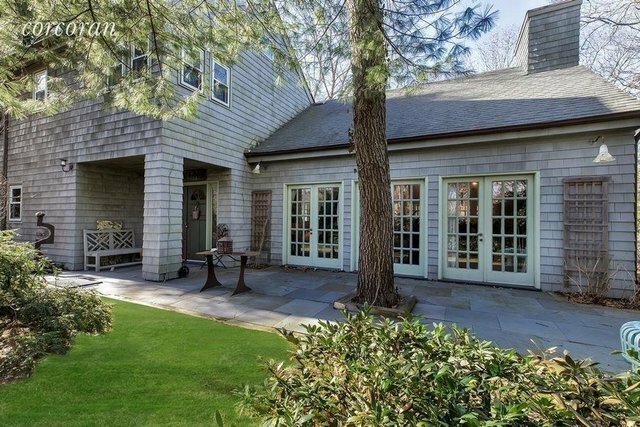 Classic French doors flank the living space, opening to the front and rear flagstone patios. The rear patio is framed by a breezy screened-in porch, terrific for summer entertaining or quiet moments with your favorite summer beverage! The functional and carefree open floor plan boasts a wonderful chef's kitchen with stainless steel Sub-Zero, Viking and Miele appliances. Wide-plank custom pine flooring and Defiant wood-burning stove complement the architect's vision. 253 Three Mile Harbor Road offers 3 bedrooms, 2 baths, including a large ensuite master, plenty of closet space, an added loft space, and replaced windows with bucolic views to the outdoors. Relax outdoors amidst thoughtfully landscaped paths blooming throughout different seasons, leading to the contemplative "tea house" and shed accessory structures. This property will delight experienced and aspirational gardeners alike. Bring your vision to 253 Three Mile Harbor, a fresh palette sporting room for pool and tennis, all within close proximity to Town and world-class beaches.